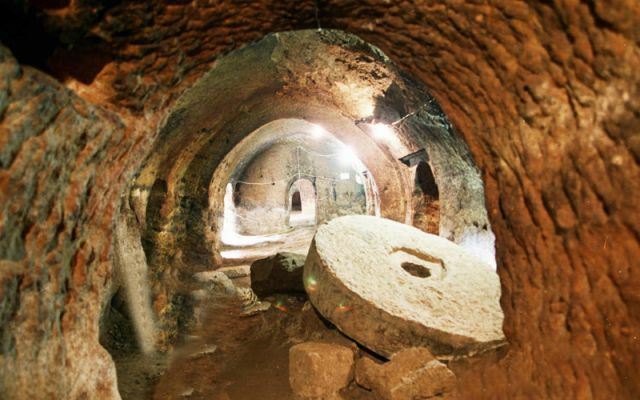 Mind-boggling, breathtaking, and incredible is the massive ancient underground city discovered beneath a house that was being renovated in Turkey, and is still to this day being further uncovered. 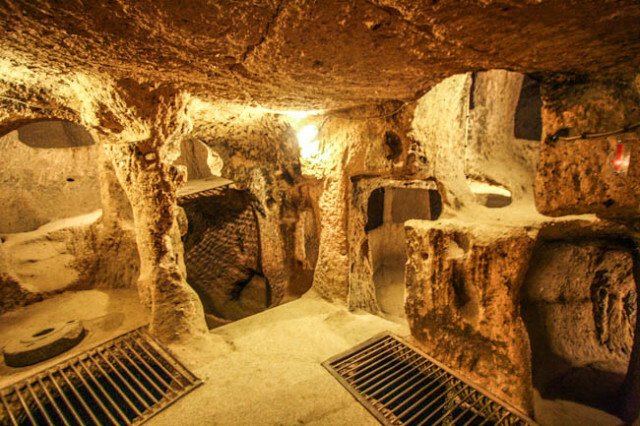 Derinkuyu Underground City is an ancient multi-level underground city in the Derinkuyu district in Nevşehir Province, Turkey. It is on the road between Nevşehir and Niğde, at a distance of 29 km from Nevşehir. With its thirteen floors extending to a depth of approximately 85 m, it was large enough to shelter well over 20,000 men, women, and children. This would be a massive undertaking even with our technology today! How on earth did they do this? 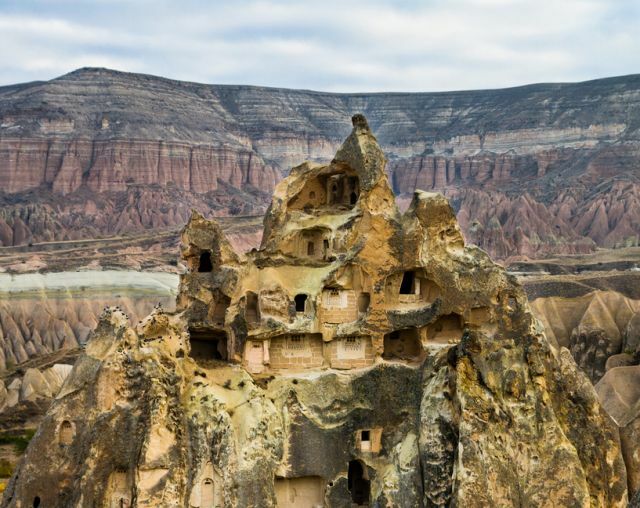 Turkey’s Massive, Ancient Underground City was discovered in the 1960s in Turkey, when a modern house above ground was being renovated. It is still, to this day, being excavated. It is the largest excavated underground city in Turkey and is part of a network of several underground complexes found across Cappadocia. It also has individual quarters, shops, communal rooms, tombs, arsenals, livestock, and escape routes. There’s even a school, complete with a study room. It begs the question: ”Why would people want to live ‘that’ deep underground?” Was it used as a giant bunker to protect its inhabitants from nuclear war or some other type of disaster? Was it built by the Nephilim and Rephaim for their ‘future’ bloodlines to survive the end times disasters, which is the ‘Great and Terrible’ Day of the Lord? Isaiah 2:10-21 10 They will hide in caves in the rocky hills or dig holes in the ground to try to escape from the Lord’s anger and to hide from his power and glory! 11 A day is coming when human pride will be ended and human arrogance destroyed. Then the Lord alone will be exalted. 12 On that day the Lord Almighty will humble everyone who is powerful, everyone who is proud and conceited. 13 He will destroy the tall cedars of Lebanon and all the oaks in the land of Bashan. 14 He will level the high mountains and hills, 15 every high tower, and the walls of every fortress. 16 He will sink even the largest and most beautiful ships. 17 Human pride will be ended, and human arrogance will be destroyed. Idols will completely disappear, and the Lord alone will be exalted on that day. 19People will hide in caves in the rocky hills or dig holes in the ground to try to escape from the Lord’s anger and to hide from his power and glory, when he comes to shake the earth. 20 When that day comes, they will throw away the gold and silver idols they have made, and abandon them to the moles and the bats. 21 When the Lord comes to shake the earth, people will hide in holes and caves in the rocky hills to try to escape from his anger and to hide from his power and glory.22 Put no more confidence in mortals. What are they worth? Could it be possible that the Nephilim bloodlines have long prepared themselves for the coming ‘Great and Terrible Day of the Lord’? NOTE: The below video is being posted so you can see more information on this phenomenal underground city. However, be aware that what the world believes to be ancient aliens are really Nephilim and Rephaim.